After Robert Wyatt departed SOFT MACHINE in late 1971, he formed Matching Mole (or Soft Machine in French) and continued playing a more Rockish Improvised music than the Softs were interested in at the time. The band lasted for less than two years, and ended when Robert suffered a fall, which paralyzed him from the waist down, confining him to a wheelchair, and yet another incarnation as a quirky vocalist with plaintive voice! Last year, Cuneiform released a compilation of Matching Mole performances (reviewed in another issue), and has done so again, this time releasing an entire set, and it’s quite a good one, despite being a little tired-sounding in spots. From my sketchy details, it seems to have been recorded in Amsterdam, Holland, a regular stop on the bands touring itinerary. As usual, the band is Phil Miller (Guitars), Bill McCormick (BassGuitar), Dave MacCrae (Electric Piano), and Mr. Wyatt’s Drums and voice. They begin slowly, building from the intro fanfare into one of Wyatt’s less-inspired vocalese numbers, but immediately extract themselves from mediocrity with some serious playing, and a most interesting bridge between "Smoke Signals" and "Part of the Dance". The latter tune has some hot playing from McCormick, and nice comping from MacCrae’s Piano, and the vocal section maintains the drive of the piece without any drunken rambling from Wyatt. There’s interesting counterpoint from the three instrumentalists, and they slide into a transition into No ‘alf Measures", an almost Jazz Waltz, with delicate Piano and vocals, devices that would go along with Miller into his next band, the infamous HATFIELD & THE NORTH! "Lything and Gracing" is entered into aggressively, the band taking a round of solos over the vamp, including some impressive work by McCormick, and formidable solos by the others. The real surprise, however, is the last Tune. "Waterloo Lilly" originally turns up on the Fourth Caravan LP of the same name. It’s a tasty little riff, which seems right at home in this band’s hands, and they obviously enjoy playing it a great deal, unhampered by the vocals. The riff is opened up and fully explored, but the tune fades at a rather undetermined point in the tune. There is much to like about this release, but I’d say it not essential for understanding or appreciating "Canterbury music", the main "school" this music comes out of. 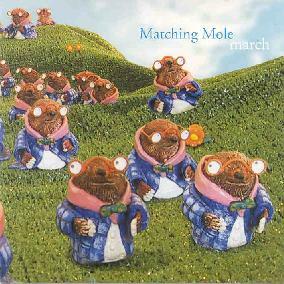 Canterbury fanatics and completists will buy, but a better place to start with Matching Mole would be their Smoke Signals CD, released last year by Cuneiform. Meanwhile, I think I’ll be playing it more than once, and will wait for a more fiery MM concert to be released. I’d recommend the 5/8/72 Paris show, it’s really hot and with today’s technology, the cassette version that gets traded amongst collectors could most likely be cleaned up for release.